Europe and beyond | What Car? Volkswagen's New Compact Coupe (pictured) is a stylish two-door hybrid based on the next Jetta saloon, which arrives in the UK in a year's time. 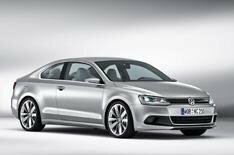 The group's sales and marketing chief, Dr Christian Klingler, admits he would like another coupe to slot between the Scirocco and the Passat CC, and this one looks ready to be it, with or without hybrid power. Audi revealed a second vision for an electric sports car to back up its efforts at Frankfurt last autumn. It has again used the e-tron name, but this one is mid-engined and is based on the same architecture as the VW Concept Bluesport roadster that was at Detroit a year ago. Both the VW and Audi could go into production, with a Porsche based on the same underpinnings to follow. VW head of research and development Dr Ulrich Hackenberg hopes to announce a decision within a couple of months. Mercedes chose freezing Detroit to showcase the all-weather capabilities of its new E-Class cabriolet, which has a screen-top wind deflector (Aircap) and seat-mounted neck-warmers (Airscarf). It also revealed a sculpture giving strong clues to the look of the next CLS. There was nothing all new from either of Korea's big two, Hyundai and Kia, but plenty the Americans haven't seen before. On a nearby stand, though, Chinese manufacturer BYD (Build Your Dreams) had brought along its all-electric e6 mid-sized hatch, which goes on sale in the US later this year and could eventually be made in America. BYD, which began making cars only five years ago but has ambitions to be No 1 in the world by 2025, will announce its plans for western Europe at the Geneva motor show in March.